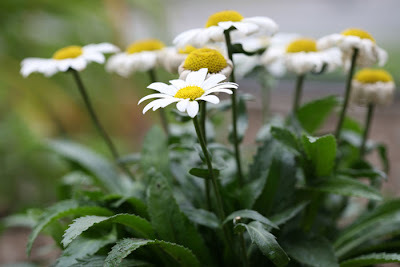 I added a new perennial to my front garden: Shasta Daisies. They can survive in planting zones 5-10. They like well drained soil and full sun. They are very drought tolerant, and can withstand more summer heat than many plants. Care includes deadheading (this will promote further blooming), and dividing the plant every 2-3 years. They have sturdy stems, and flowers easily remain upright even after a hard rain. So far I've deadheaded a few flowers from the plant I bought, and it continues to thrive. Hopefully it'll be a part of my garden for years to come!